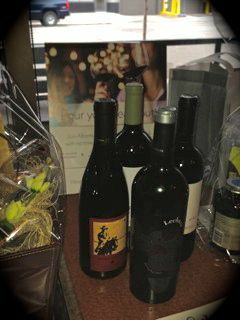 WineCollective recently took part in a Multiple Sclerosis Fundraiser with the help of our friend, Amy Nadeau. Amy is one of 100,000 Canadians living with MS. While the disease is life changing, she has managed to put together fundraisers such as the one held earlier this month on May 10, as well as run the MS 10km run that took place this past Sunday, May 25 in Calgary. The fundraiser was held at the Blind Monk Pub with over 90 guests supporting the cause. A total of $7,000 was raised for the Multiple Sclerosis Society of Canada. WineCollective donated an Evolution Mixed package, valued at $90, which sold in a silent auction for $105. It appeared to be one of the more popular donations at the event! The MS fundraiser was also supported by various donations from breweries, wine representatives and yoga studios. VIP tickets to a Calgary Flames game were also up for bidding. In addition to the auction, Hot Super Hot, volunteered to entertain the guests with their Caribbean jams throughout the evening. As always, we feel very thankful and overjoyed to be able to take part in fundraisers around the city. Some members of the WineCollective team have personal connections to those living with MS and understand the struggle and symptoms of the disease. We are always willing to assist in any way we can. Thank you to Amy and those who attended the event in support of finding treatment for MS. Click here to donate today to the MS Society of Canada and keep an eye out for future fundraising events supported by WineCollective to find out how you can help and donate.